They're very lightly salted, so they don't have a lot of flavor on their own, but they're reasonably strong, so if you want to dip them in something, they should safely hold a good quantity of dip. We tried dipping them in hommus, and it worked quite well. 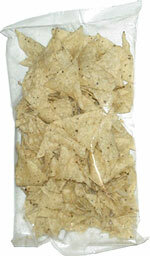 Smell test: Regular tortilla chips smell, weak. From the package: Nothing. The bag is clear and completely blank.